We hope that you will enjoy exploring this exhibition which aims to highlight a lesser known aspect of medieval Irish society and the range of medical learning to which Irish doctors had access and which they made their own. In medieval Ireland, the practice of medicine, like law and history was hereditary ― the work was confined to certain professional medical families through the generations. These professionals organised and regulated the medical schools in Ireland, notably the school at Aghmacart, Co. Laois, run by the Ó Conchubhair in the Mac Giolla Phádraig lordship of Upper Ossory. 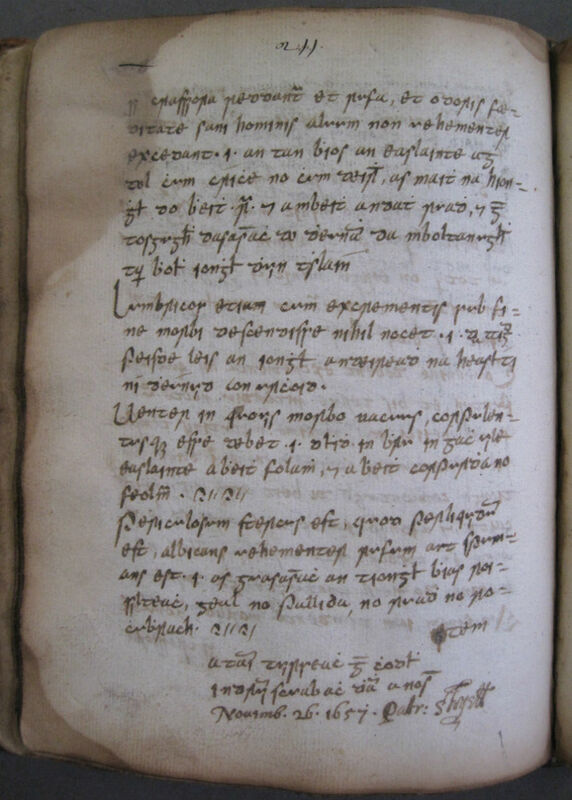 The work of two of the best known Ó Conchubhair doctors, Risteard Ó Conchubhair, 1561-1625, and Donnchadh Óg Ó Conchubhair, fl. 1581-1625, features in this exhibition. At Aghmacart, students were trained in medicine and in the compilation and translation of medical texts from the Latin. 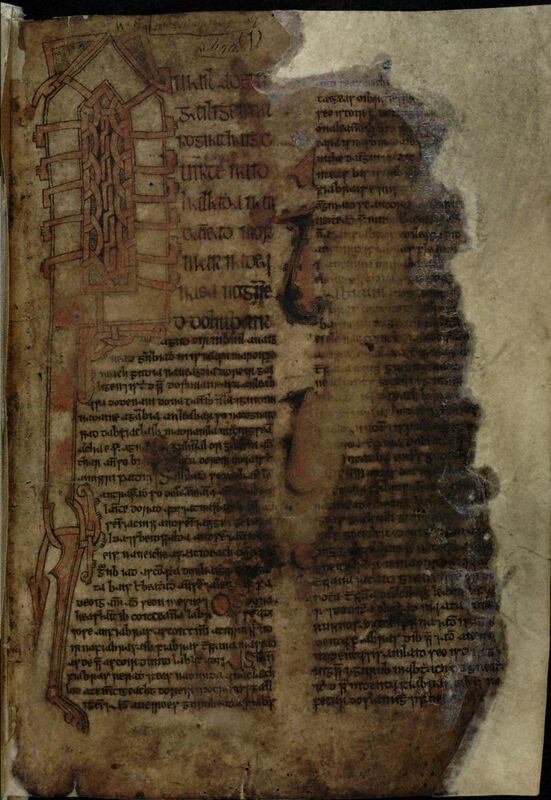 Almost 100 medieval manuscripts survive that contain medical texts in Irish. The largest collection of these manuscripts is in the Royal Irish Academy. They consist mainly of translations or adaptations of continental Latin treatises into early modern Irish. The Irish practitioners were unusual in translating the texts into the vernacular rather than working from the Latin as was the norm elsewhere in Europe. Many of these Latin versions had been translated from Greek or Arabic by early practitioners in France and Italy. The compilations were made for practical purposes – for the use of doctors in the course of their working lives. The compilations shown here often consist of texts based on a variety of sources. The Lilium medicinae by Bernard of Gordon was one of the most popular texts used by the Irish doctors, but they used a very broad range of texts compiled by doctors at the medical schools of Montpelier and Salerno and other English and continental universities from the twelfth to the seventeenth century. 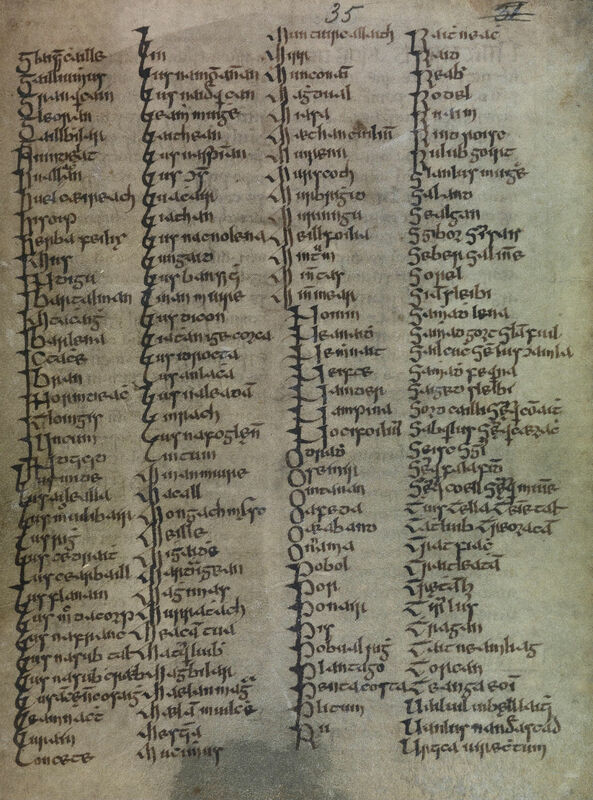 The Book of O'Lees (RIA MS 23 P 10 (ii)), written in Irish with some Latin, contains a translation from Latin into Irish of a highly organised medical treatise, with 44 tables outlining details of diseases, each divided into 99 compartments, across, aslant, and vertical. These are coloured red and black, and comprise descriptions of different diseases, showing name, prognosis, stage, symptoms, cures, etc., of the disease in question. There are rough decorative drawings at the top left margin of many pages. A. Nic Dhonnchadha has shown that the text is a faithful rendering from the Latin Tacuini aegritudinum, which was itself translated from the Arabic of the Islamic physician Ibn Jazlah (d. 1100) of Baghdad. This work was completed in Sicily in 1281 by Faraj ibn Salim (fl. 1273-82), a Jewish physician and translator. 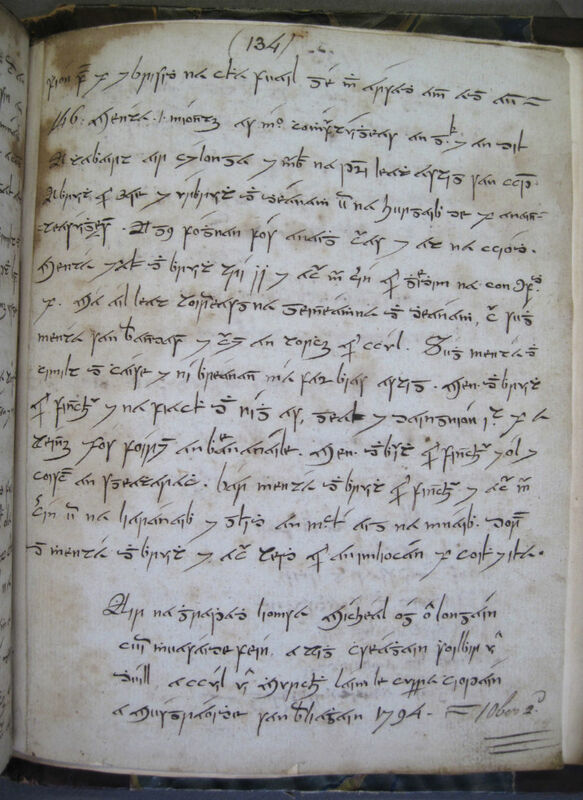 The text first appeared in print in 1532; therefore, the compiler of 23 P 10 (ii) must have been working from a Latin manuscript .Eugene O’Curry, MRIA, recorded (H&S Catalogue III, p. 644) that the manuscript was bought for the Academy in the town of Galway from Thomas Keady, to whom it had come from the O’Lee family, hereditary physicians to the O’Flahertys. In the course of the 17th century a member of the O’Lee family told a ‘wild story’ of his having been magically transported to the enchanted Island of Hy Brasil and obtaining supernatural knowledge of medical cures there that were recorded in this book. The unusual appearance of the book convinced some people of the validity of this story. More often they annotate their books with mentions of where they have written down certain texts; they comment on the weather, or on the hospitality of the household in which they are staying, and generally note the date of writing. From these snippets of information we can begin to build up a picture of the peregrinations of these doctors around the country, as they treat their patients and spend time with their families. Prominent medical families in Connacht included Ó Fearghusa (Fergus) and Mac an Leagha (MacKinley), physicians to the O’Flahertys; in Leinster, the Ó Bolgaidhe (Bolger) and Ó Conchubhair (O’Connor); in Ulster, Ó Caiside (Cassidy), physicians to the Maguires of Fermanagh, Ó Duinnshleibhe (Dunlevy), who looked after the O’Donnells, Ó Siadhail (Shiels, O’Shiel), physicians to the MacMahons of Oriel; in Munster, Ó hIceadha (Hickey), physicians to the O’Briens of Thomond, as well as Ó Leighin (Lane) and Ó Nialláin (Nealan/Niland). Brief details of some of the key authorities on whose works these texts are based may be found here. This medical tract contains the Aphorisms and Prognostics (Prognostica) of Hippocrates, with accompanying commentary by Gulielmus Copus of Basel, 1461-1532. The manuscript also contains the text of Aegidius’ much-cited work, De urinis, which deals with kidney stones, the various colours of urine etc. Note the use of Latin for the headings and introductory sections, referencing the original text on which the translation is based. 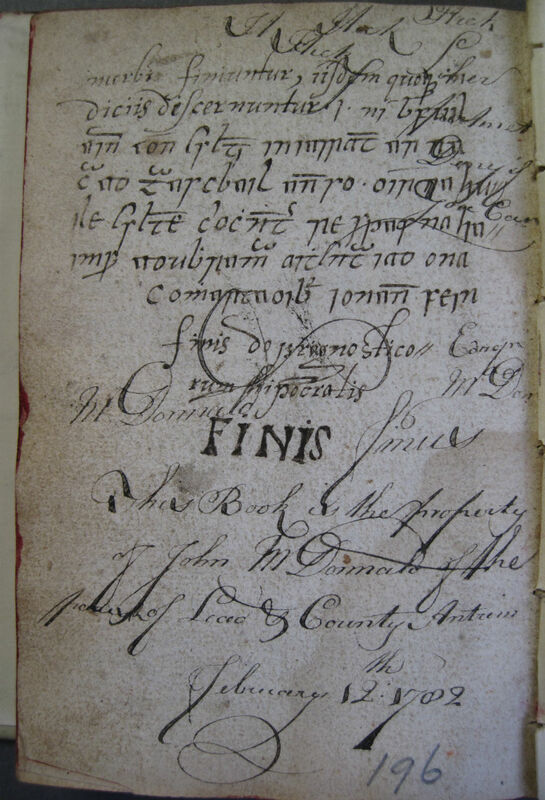 p. 196 above attests to the manuscript’s ownership by John McDonald, parish of Lead (Layde), Co. Antrim in the late 18th century, and there are copious marginal notes and iou’s from this period scattered throughout the document. It was later owned by Bishop William Reeves. … while I was treating his two daughters for a menstrual irregularity. 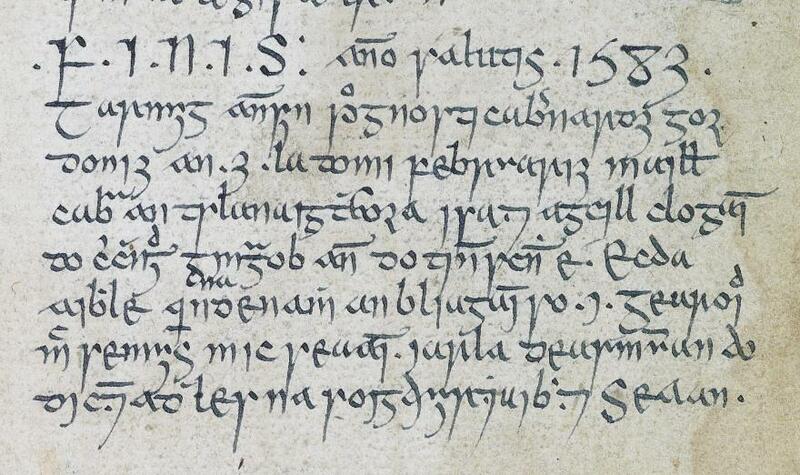 To view RIA MS 24 P 14 in full go to www.isos.dias.ie. I am in Killaspugbrone tonight, St Martin’s Eve, 1658. I am grim Pádraig O’Sheil: and let everyone who will read this bestow a blessing on my soul. Killaspugbrone is in the barony of Carbury, Co. Sligo. See RIA MS 23 K 42, pp. 123-4, below, showing the end of Hippocrates’ Aphorisms, Bk 7 and the beginning of Aegidius’ De urinis, specifically on the significance of the colours of the urine. 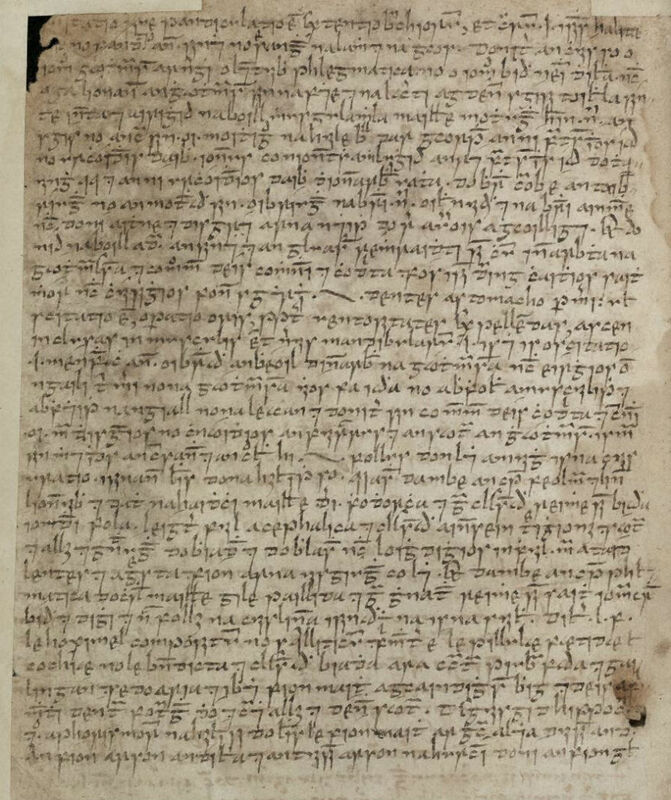 This tract was used as a working document ─ the O’Shiels were hereditary physicians to the MacMahons of Oriel (Airgialla), in the north-east of Ireland. The same applied to most of the medical manuscripts. These were not prestige works. Their purpose was practical. Dr A. Nic Dhonnchadha considers that this indicates that the medical education on offer in Ireland at the time was regarded as being on a par with that on offer on the continent. 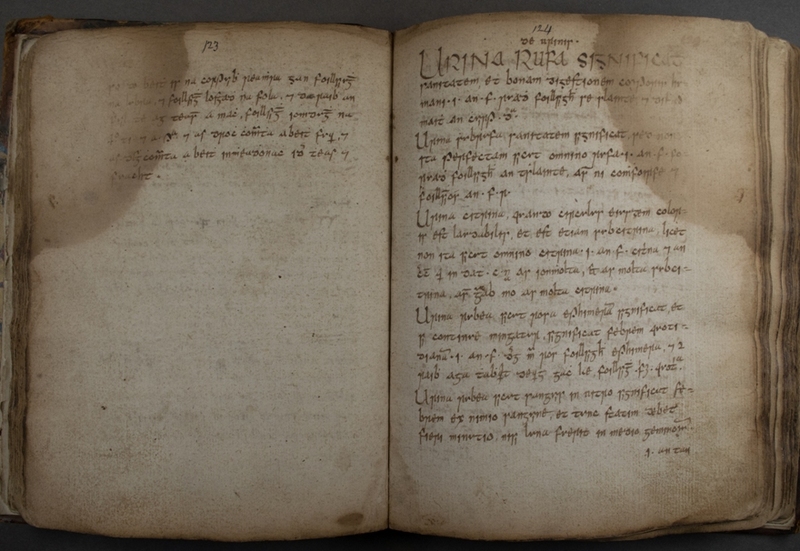 The contents of the manuscript include versions of Bernard of Gordon’s Lilium, the Decem Ingenia and Prognostica. 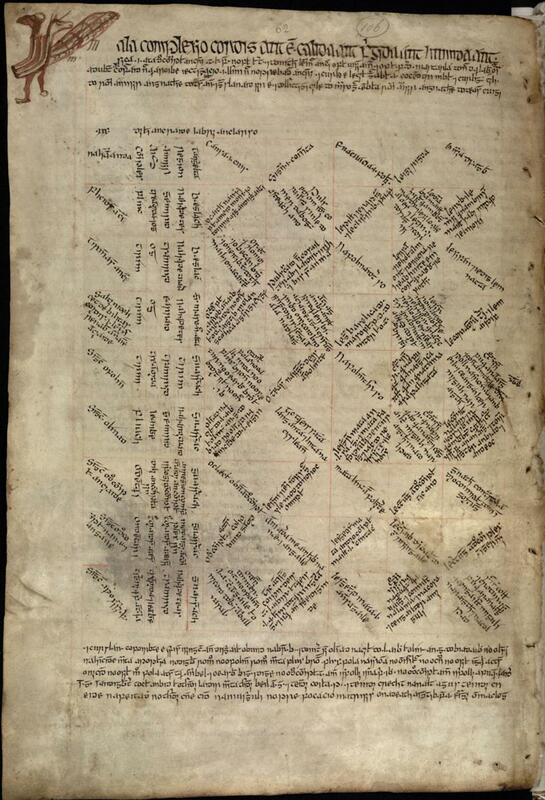 Folio 2r begins – ‘Febris est calor innaturalis’ – ‘Fever is unnatural heat’ – a tract on fevers. Misi Risderd mac Muircertaigh rosgriobh agus Baile in Gronta mo log a nOsraighi a bfochuir mic Gilla Patruic i Finghin mac Briain mic Briain. 1590. It is I, Risderd son of Muircheartach, who wrote [this] and, Grantstown [bar. Clarmallaigh, Co. Laois] is my place [of writing] in Ossory, in the company of Mac Giolla Phádraig, i.e. Finghin son of Brian, son of Brian. 1590. 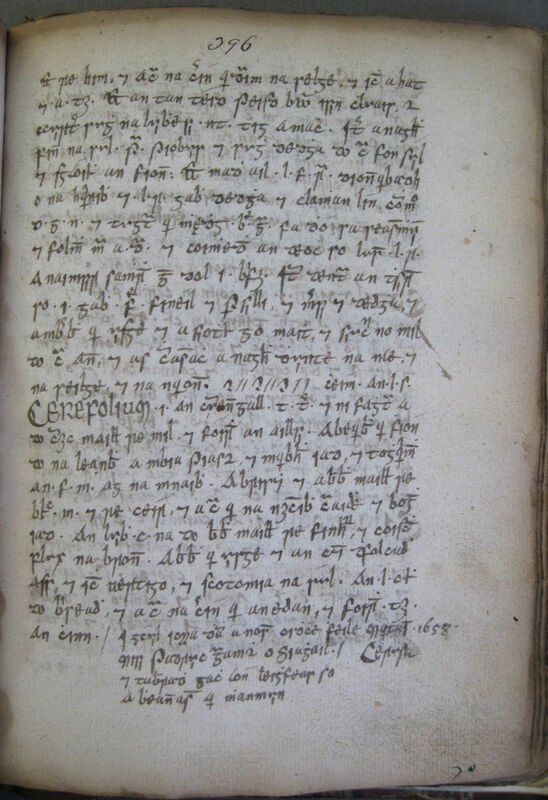 To view this manuscript in full go to www.isos.dias.ie. Anno domini 1596 an 13 la do Maius. a nAchaidh mhic Airt dam an tansa a bfhochair Dhonnchadha óig í Chonchubhair agus is urusa dhamh anois bheith dobrónach óir adime mo charaid agus mo chumpanach uaimh = Mairghrég inghen Donnchadh agus dar an leabhar ní fes dam créd do dhén ina hégmuis fesda. On 13 May in the year of our Lord 1596, I am in Aghmacart now in the company of Donnchadh Óg Ó Conchubhair. And it is easy for me now to be sad for my friend and my companion has left me, i.e. Mairghrég, daughter of Donnchadh, and upon my word I don’t know what I shall do without her from now on. RIA MS 23 O 6, early fifteenth century, consists of four manuscripts bound together, a miscellany of medical material; the former owners and scribes are not known. Various sources are cited, including Aegidius’ De urinis, Galen, Avicenna, Bernard of Gordon et al. Contents include lists, e.g. the ingredients of poison and antidotes; colours of the urine; and properties of beans and barley. A list of plant names occurs on p.35 shown here. Botany was an important element in medieval medicine and Irish doctors were renowned for their knowledge of the properties of plants. 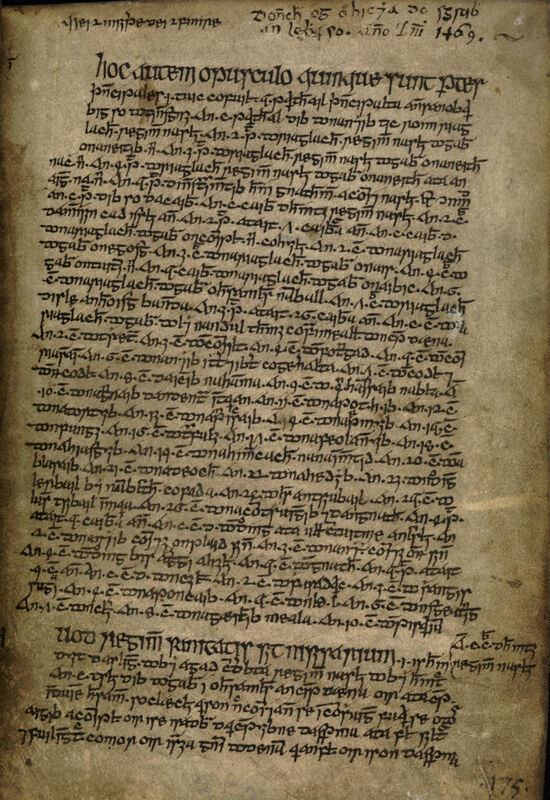 RIA MS 24 P 26, A.D. 1469, written by Donnchadh óg Ó Híceadha. 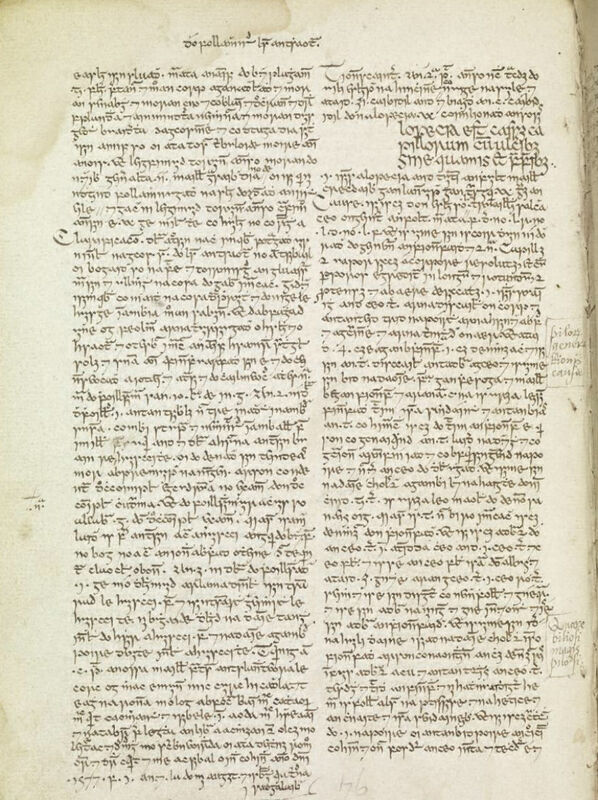 The O’Hickeys were physicians to the O’Briens, MacNamaras and other families of Thomond; it contains Geraldus de Solo’s commentary on Rhazes’ Almanzor, Pietro de Argelato’s De chirurgia and Arnaldus de Villa Nova’s Regimen sanitatis. Owned by Belfast engineer Robert MacAdam in the nineteenth century, it was previously owned by Edward O’Reilly (1830 sale catalogue, lot no. 4) and latterly was the property of Bishop William Reeves. Reeves cites the O’Reilly sale data on the flyleaf and notes: ‘I bought it in Nov. 1889 together with a large collection of Irish MSS. from Mr Robert MacAdam, & it is the gem of the lot …’. The book remained in O’Hickey hands for several hundred years; evidenced by annotations therein. See p. 353 below, for the beginning of the Regimen sanitatis. Note Donnchadh Ó hIceadha’s dating of the compilation to 1469 on p.352. MS 23 P 20, [sixteenth-century ? ], scribe unknown, is a copy of John of Gaddesden’s Rosa Anglica, which includes material not found in the printed version of the text. John of Gaddesden (Johannes de Gaddesden), c. 1280-1361, is thought to have hailed from Gaddesden on the borders of Buckinghamshire and Hertfordshire. He studied at Merton College, Oxford, obtaining degrees in arts, theology and later, medicine. According to Winifred Wulff ’s biography in the introduction to her edition of the Irish translation of his Rosa Anglica (London, ), John was the first eminent English physician to have completed his medical training in England. He used Bernard of Gordon’s Lilium in compiling the Rosa in 1314. Furthermore, the Irish translator of the Rosa borrowed extensively from the Lilium in compiling his translation of the Rosa. John refers constantly to his practice at Oxford. He eventually became court physician to Edward III, whom he is supposed to have cured of smallpox. Not known for his humility, John explained the title of his text – ‘just as the rose excels among flowers, this book excels among textbooks on practical medicine’. Wulff points out that while there are many reasons to criticise Gaddesden’s text (for example, his poor efforts at interpreting Greek terms – he was widely regarded later as a charlatan), the text has a lasting value for the insights it provides on daily life during the Middle Ages, the remedies used, the contents of the larders, charms etc. – ‘a hot- potch of medical teaching, genuine or fabulous results of the application of remedies, oriental leechcraft and superstition, native English cures and charms, prayers and religious practices, interwoven with the native beliefs of the country’. The Rosa Anglica was first printed at Pavia in 1492. MS 23 P 20, p.3, Rosa Anglica, in Irish, 16th century ? 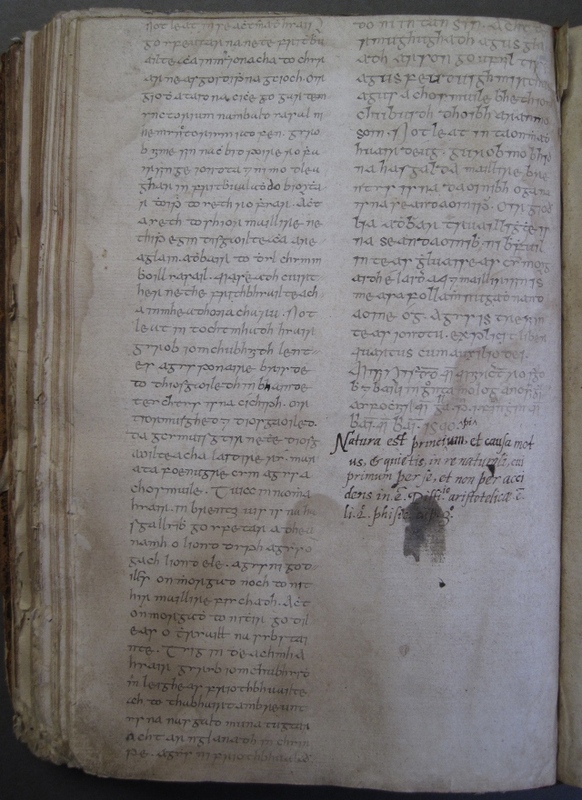 RIA MS 23 P 10 (iii), a fifteenth-century treatise, formerly owned by Searga Ó Conuill. 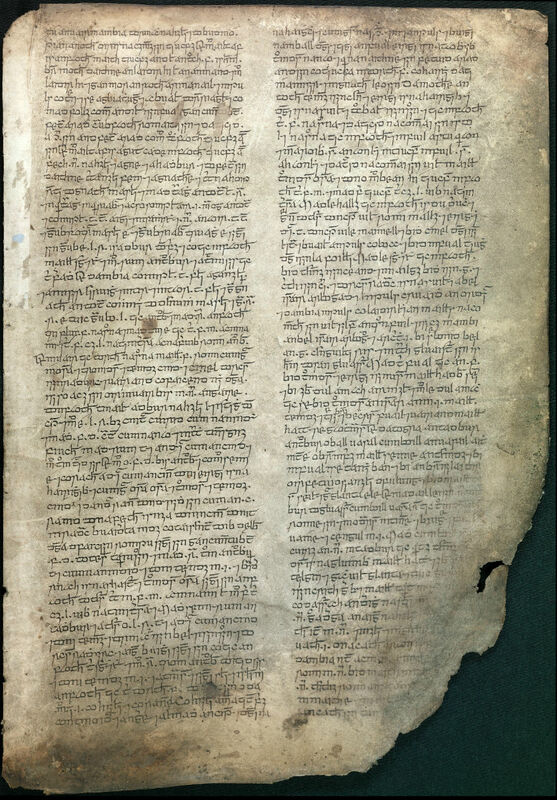 Probably written in Co. Clare, contains the major part of Book 1 of the Rosa Anglica, the opening page of which is shown here, and has texts by other English authors, Bernard of Gordon and Gilbert the Englishman (Gilbertus Anglicus), c. 1180-c. 1250. RIA MS 23 P 10 (iii), p.1. Curracha Chiopain a Musgraide san mbliaghain 1794, December 2d. 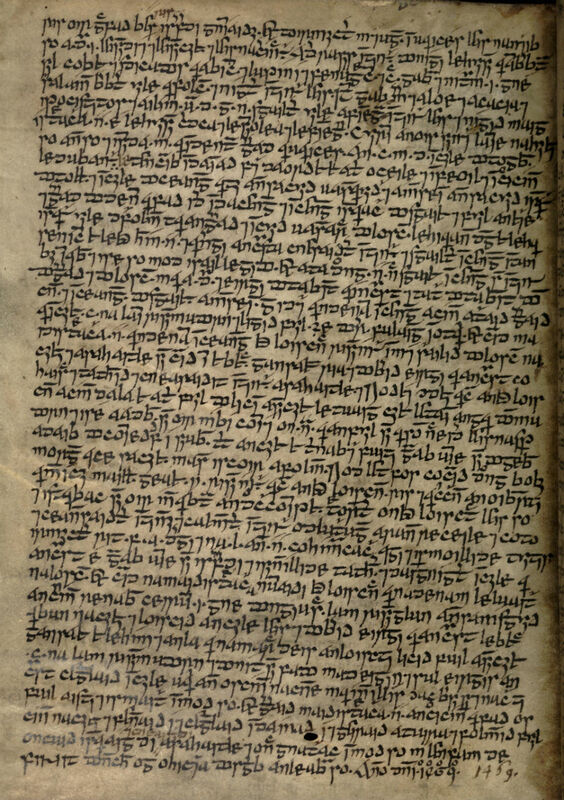 Micheál Óg Ó Longáin also compiled copies of Materia medica, based on a Salamanca exemplar, for Henry Joseph Heard, DD, (RIA MS 3 B 15). 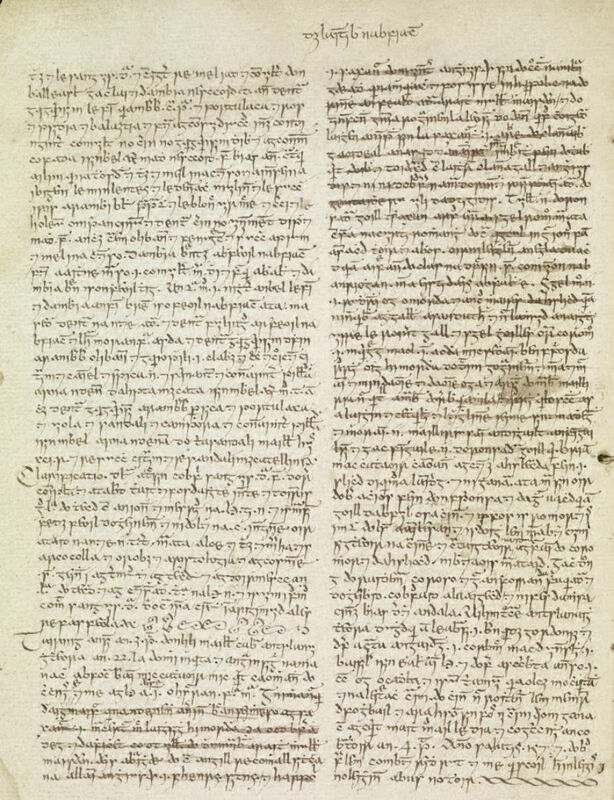 Micheál Óg’s youngest son, Seosamh, 1817-80, also made a copy of this text which he attributes to Irish physician Tadhg Ó Cuinn, explaining that it was compiled in Salamanca by Ó Cuinn in 1139. 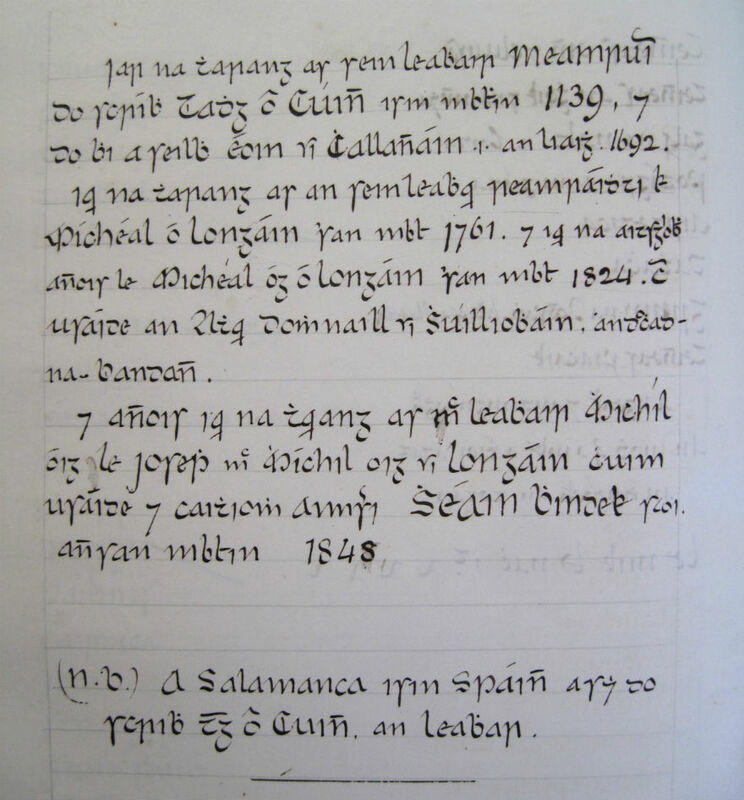 Seosamh Ó Longáin’s copy was made in 1848 for the Cork patron, John Windele, 1806-65. 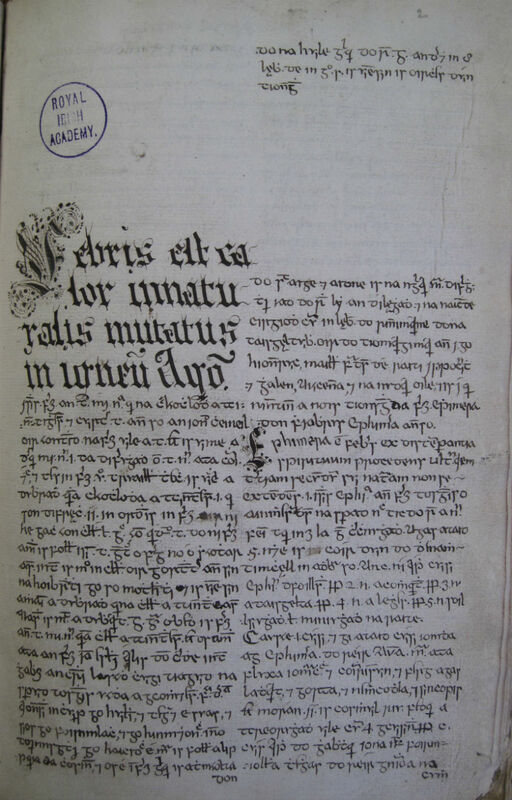 This copy (RIA MS 24 B 2) is shown below.